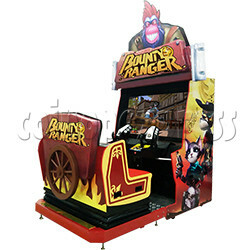 Bounty Ranger Shooting Game Machine is a video shooting game machine that players will play two armed bounty rangers which leopards and catwoman. Build into the 55" LCD screen to show the play interface and equip two luxury laser guns for player interact with the shooting game. The game follows the typical pattern of co-op mounted shooters, players capture wanted criminals in different game scenarios in exchange for a bounty. Bounty Ranger is suitable for younger and parent-child player. About Bounty Ranger is similar as Let’s Go Island Motion Deluxe cabinet released by Sega. - select the stage by the gun, and then follow the instruction to shoot the targets to win scores. - The game revolves around rhino foreman, logging splasher gorilla, bull and sandworm, involve western characteristic town, sandy desert, underground dark cave, green giant trees and other game scenes, bring different shooting experience for players.